Gaining admission into any medical residency program offers quite a hectic task involving series of application. With just 30,000 admission openings for over 40,000 applicants into the medical residency program in the US, including IMG residency programs the stage becomes set for SOAP application as alternative means into medical programs in the US. As part of the requirements include the nursing personal statement aimed at fine-tuning one’s chances of admission into a residency program. SOAP as an acronym means Supplementary Offer and Acceptance Program. It is a program designed to help cater for and allocate unmatched candidates to appropriate programs of their choice that are not filled or partially filled across medical colleges in the US. 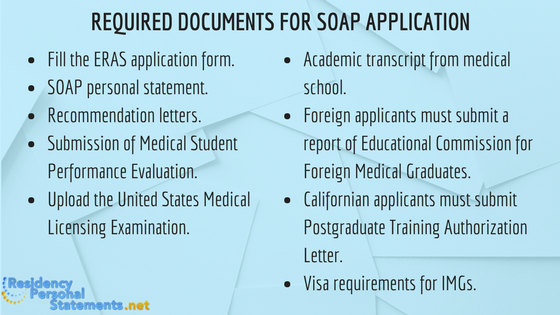 For SOAP residency advice and letter of intent residency application helps our experts are always on the ground. How Does SOAP Application Work? The Friday prior to matching applicants will be informed of their eligibility for Supplemental Offer and Acceptance Program (SOAP). Eligible applicants prior to 1st of July a link to NRMP site for more information. By Monday 11 a.m. all eligible applicants yet to receive the link will receive a list of the remaining list of unfilled programs. Eligible applicants can then apply to programs yet to be fully matched from 3 p.m. on Monday. By midday on Wednesday, a list of successful matched SOAP residency application will be released giving applicants just two hours to accept or reject the offer of the admission committee. By 3 p.m. the same Wednesday the second list of SOAP will be released for acceptance or rejection. By Thursday of the same week, lists of SOAP gets released by 9 a.m., 12 p.m., 3 p.m., and 5 p.m. the conclusion of matching. Expect contacts or calls from SOAP programs scheduling interviews with you for residency course. Do not initiate any contact with the institutions but wait for their call. Admission seekers must only apply for unfilled programs as published by NRMP and one has eligibility. Use uploaded ERAS application to apply via MyERAS. To apply to programs whether SOAP for dermatology residency or any other program for that matter; as long as it is not part of the matching process you need to wait until after the residency match week. All unmatched applicants should only accept SOAP positions for the residency program. What Makes One Eligible for the SOAP Program? To be eligible for all medical residency or Cal SOAP application an applicant must register by January for mid-march matching and get ready to commence from 1st July annually. Registration commences in January but must be complete by latest 21st February, for 2018 admissions. Applicants should secure all graduate medical education certification before July 1st post-match SOAP to qualify. Must possess ECFMG certificate. Meaning applicants must have sat and passed the ECFMG examinations. All applicants must submit a copy of their examination results early enough to secure matching. To be eligible the candidate should be yet to be matched or only partially matched. There are about 30,000 openings for medical residency programs in the US. However, there are well over 40,000 applicants annually seeking opportunity into residency programs in the US. SOAP program makes it possible to coordinate the list of applicants for a medical residency course, matching each applicant into available residency spaces. Each applicant must understand and follow the application schedule that runs for one week or miss admission. Applicants can receive multiple matching into different programs of choice but will only get two hours to decide whether or not to accept the program or which to pick. 2017 Main residency match offers the highest number so far with 43, 157 candidates. Programs with the highest intakes in 2015 include Preliminary General Surgery with 446, Family Medicine with 149 and Preliminary Internal Medicine with 118 vacant positions. A total of 1,100 remained after the end of the main match in 2012 with 815 senior graduating students from medical school unmatched. There were more unmatched candidates from family medicine, rotations in surgery and internal medicine. Applicants fill a Rank Order List in January to ensure consideration into the program when matching commences mid-march. Matching lasts for four days only from Monday to Thursday. Fill the ERAS application form. Fill ERAS application via AAMC’s ERAS website. Submission of Medical Student Performance Evaluation (MSPE). Upload the United States Medical Licensing Examination (USMLE). Academic transcript from medical school. Foreign applicants must submit a report of Educational Commission for Foreign Medical Graduates (ECFMG). Californian applicants must submit Postgraduate Training Authorization Letter (PTAL). One place you should not make a mistake is in writing your SOAP personal statement because you should have ample time to pick three to four specialty areas early enough and write an updated personal statement for SOAP beforehand. Writing a personal statement for SOAP can increase your chances of admission significantly when applying to a Post-Match selection program. A personal statement helps increase your value before the admissions committee by portraying you as a professional candidate with readiness and excellent input to bring to the program. Writing a specialty focused personal statement helps display how much interest you have in that specialty and boost your performance. The SOAP personal statement encapsulates your academic achievements, aspirations for your specialty and future ambitions. The introduction or beginning paragraph of your SOAP personal statement holds the key to either retain the committee’s readership or lack of interest to continue reading. Therefore your introduction must be captivating. An excellent personal statement should capture the whole essence of your ERAS application or residency needs in one page of about 300-500 words. When writing a personal statement come from the angle of past experiences with relevance to your specialty or chosen field and display how such experiences can help your current aspiration or make you the best candidate for the program. Your new personal statement for SOAP must show how enthusiastic you are about a particular specialty and write it long before the post-match period helps you do an excellent job. Focus on your key areas of strength and avoid trying to impress. In one page, present a precise and concise personal statement by avoiding ambiguity and verbosity. Use the personal statement to explain what you could not expatiate on in your Resume/ CV. Use notepad in writing your personal statement. Your personal statement should be Courier font character, font size 10, single line spacing, 1-inch margins left, right, up and down, no italics, bold or the use of underline. 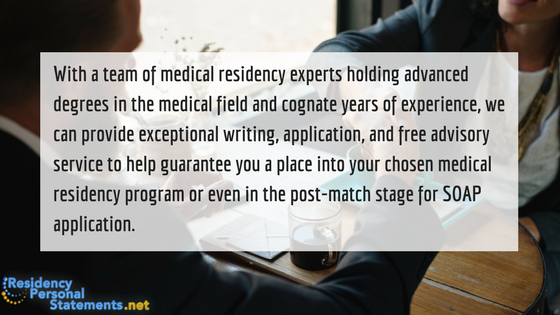 The whole process for the application for a residency program leading to the SOAP and post-match stage is an exercise we have executed successfully countless time for our clients and we can help you achieve your medical residency stress-free. With a team of medical residency experts holding advanced degrees in the medical field and cognate years of experience, we can provide exceptional writing, application, and free advisory service to help guarantee you a place into your chosen medical residency program or even in the post-match stage for SOAP application. Beginning with the initial ERAS documentation, writing personal statement SOAP and application needs, our team of professionals can prepare a flawless document with a comprehensive guide to help you stand out from the crowd easily. Because we are so sure of our offering we can give you a 100% satisfaction guarantee, privacy of your information and 100% originality of content or we refund your money back 100% if we do not satisfy your SOAP application needs. Our payment processors offer some of the highest security online with easy to navigate sites, direct communication with the writer of your documents and 24/7 customer support for inquiries. We are native English speakers and therefore understand how the ERAS and SOAP application process go when writing a personal statement, letter of intent, resume, letter of recommendation and more. 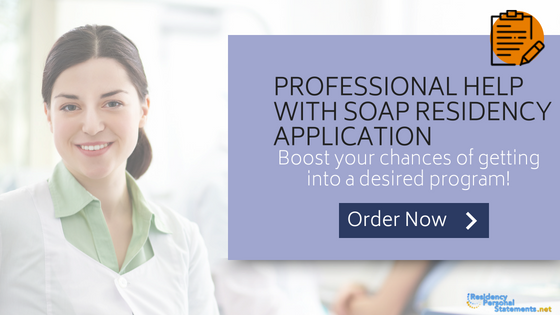 Enjoy premium service for SOAP application when you place an order now and cause your application to stand out of the lot through our professional writing, ERAS application and SOAP documentation help. Our goal is to help you to get the grade you want! Let our specialists become your comprehensive guide for SOAP application today!